Casino Heroes is the latest and newest of online casino Canada platforms. Here we present to you a look inside and bring you information on the games available, the software which powers them and the casino. You will learn about the services and banking, with a final look at the promotions on offer, ending with our final thoughts. One thing you should prepare for… there really is no other casino like this – FACT! Games: A look at the entertainment inside Casinoheroes. Which one will be your saving grace? Casino Heroes comes with a unique blend of slots, jackpot games, roulette, blackjack, other table games, video poker and live casino entertainment. There is a wonderful selection of titles. In the lobby you have new games such as Vikings go to Hell™, Wild Scarabs™ and Blaze of Ra™. In Jackpot games you have all the big hitters; Mega Moolah™ Mega Fortune™ and Arabian Nights™ just three of the twenty-six available. There is a new feature call Islands. Enter each stage of the islands and beat the bosses who control them. There are three islands with a total of 70 boss bad guys. This isn’t Vegas here, that’s been done before. Casino Heroes is a whole new landscape and perhaps the best there has been for a while. It’s a game paradise, literally! So much more choice to play with free spins casino bonuses. The Saga is only just beginning so choose any money maker to begin. Casino Heroes is powered by the gaming development of Betsoft, Microgaming, NetEnt, Push Gaming, Quickspin, Play’n go, and Yggdrasil. All games function across all devices such as mobile, tablet, PC and Mac. The HTML5 has killed the flash so you get instant games. You can also install the casino app and pick up an extra special something that we’ll keep as a surprise. 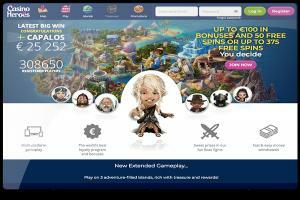 Casino Heroes will support you with a number of payment options. The website offers you to apply with deposits from the following banking methods. Visa, Skrill, MasterCard, Bank Transfer and Neteller. Any withdrawal of wins will take an average of 3-5 working days. The customer service team work 24/7 to assist you can contact them via instant messenger or by email. They are trained on all games and technical problem fixing. Well, where to begin with this one? The company knows how to reward customers when they sign up and stay. You have a good choice on offer. First, the welcome bonus is optional. Cash or Spins. Given the season you have free spins on the latest Summer Games. There is a New Slots exclusive promo offer, Casino Heroes also celebrates Happy Hour between 4 pm and 10 pm on selected days. There’s too much to mention from no deposit gifts to bonuses for new games, if you love your witches and wizard mythology then look out for the Witchcraft Academy™ coming soon. It may be new but they have already got the goods in place to challenge other sites that have been around for longer. But this Hero is new on the black and with it comes a freshness to what can be a stale format for most players in other venues. The site provides what we all need and at the right time. Gambling needed a kick up the backside and this is the result. A NEW experience to try and an adventure to be part of. It’s great and a very unique playing venue. It’s all fun with a great fortune to be won in real money. Use your bonuses to your advantage at the Heroes casino. Make the most of their free offers whether it’s a few hundred spin bonuses or real cash to play with. Enjoy!